Gabriel Garcia Marquez was one of the most popular writers of the 20th Century. He was born on March 6th in the mountain town of Aracataca, Colombia. Soon after his birth, his parents moved to Barranquilla, where his father found a job as a pharmacist. They left Gabriel in Aracataca where he was raised by his maternal grandparents, Colonel Nicolas Marquez and Dona Tranquilina Iguaran. His grandfather was an admirer of Simon Bolivar and his grandmother was an oral story teller: both had left great impact on Garcia Marquez as a future writer and novelist. In December of 1936, Garcia Marquez’s father, Gabriel Eligio took him and his younger brother Jaime to the neighbouring Sincé in Northern Colombia. His grandfather Colonel Nicolas, whom he called “Papalelo”, died in 1937. The Colonel was a Liberal Veteran of Thousand Days War. In October 17 of 1899, the ruling conservatives and opposition liberals of Colombia engaged in a brutal and destructive civil war that lasted until November 21st 1902: the so-called Thousand Days War. The main cause of the War was the fraudulent elections by the Conservatives to remain in power. As well, there was an increasing economic crisis caused by the falling coffee prices in the world market, which mainly affected Liberals and their radical allies. The situation worsened the hostility between the warring factions. The War ended when US imperialism under Theodore Roosevelt’s presidency took side with the Conservatives. Marines were sent by the US Government to protect the so-called interests of this dominant imperialist power in the Western Hemisphere. Conservatives remained in power and in November of 1903, the province of Panama seceded from Colombia by the support of the U.S. Government. On May 4th 1904, the United States formally got control of the Panama Canal which was a French property at that time. I have the honour to report that the Bogota representative of the United Fruit Company told me yesterday that the total number of strikers killed by the Colombian military exceeded 1000, (web.archive.org, by Paul Wolf). In 1967, Gabriel Garcia Marquez depicted the fictional version of the Massacre in his novel One Hundred Years of Solitude. This masterpiece became broadly popular throughout the world and mainly led Garcia Marquez to be awarded the Nobel Prize in Literature on December 8th 1982. Garcia Marquez studied law and journalism at the Universities of Bogota and Cartagena, but began his carrier as a journalist in 1948. During this period he became an active member of the informal group of writers and journalists known as the Barranquilla Group. The Barranquilla Group became one of the most productive intellectual and literary communities of Colombia. Garcia Marquez also secretly worked with the Communist Party of Colombia. From 1954 to 1955, he resided in Bogota and wrote for the Bogota El Espectador, although the Newspaper was closed by the dictator General Rojas Pinilla. In the summer of 1957, Garcia Marquez visited the Soviet Union and some of the Eastern European countries. He wrote “Soviets have a different mentality; things that are of great importance to us aren’t to them”. In December of 1957, Garcia Marquez accepted to work with the newspaper El Momento in Caracas, Venezuela. He also participated in the January 23rd 1958 civilian-military revolution of Venezuela. The Revolution removed the dictator General Marcos Perez Jimenez and established a parliamentary democracy in Venezuela. In March 1958, he made a trip to Colombia, where he married Mercedes Barcha, whom had known her since her studies in college. Together they came back to Caracas, but in March of 1959, just after the victory of the Cuban Revolution, Garcia Marquez went to Havana and participated in the foundation of Prensa Latina, a Cuban press agency, at the initiative of Che Guevara. He worked at the Prensa Latina office in Havana, and then in 1961, in New York. In Havana he befriended the leader of the Cuban Revolution Fidel Castro; a lasting comradeship which has been analyzed by him in Gabo and Fidel: Portrait of a Friendship. Due to threatening phone calls from right-wing Cubans in New York, Garcia Marquez kept an iron rod by his desk. In 1961 Garcia Marquez, Mercedes, and their first son, Rodrigo Garcia traveled by bus all the way through the Southern United States where he always wanted to see, because it inspired the writings of William Faulkner. Garcia Marquez’ writings were mostly influenced by William Faulkner and the British author Virginia Woolf. Garcia Marquez’ family eventually settled in Mexico City, where in 1964, the couple’s second son Gonzalo was born. As we saw, from his young age, Garcia Marquez was under the influence of his grandparents’ tales. He describes his grandfather –colonel as his “umbilical cord with history and reality”, and grandmother – Dona “the source of the magical, superstitious, and supernatural view of reality”, she delivered them as if they were the undeniable truth. Not surprising that in his novels and short stories, fantasia and realism are mingled in a richly composed world of imagination. He is considered an important figure in the so-called Magic Realism movement. But Garcia Marquez assumed himself primarily a realist who writes about Colombian and Latin American events exactly as he observed them. The publication of One Hundred Years of Solitude earned him fame and international recognition. Garcia Marquez used this opportunity to act as a facilitator in several negotiations between the Colombian government and the guerrillas, including the former M-19 (19th of April Movement) and the current FARC and ELN organizations, to end these long bloody civil wars. Garcia Marquez as a film critic had a long history of involvement with the cinema. In 1986 he founded the International Film and Television School in Havana, Cuba. This center which is known as the Vatican for Film Makers: is a world leader in the field of documentary film making. 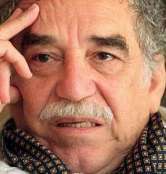 Garcia Marquez was the head of the Latin American Film Foundation and wrote several screenplays. 11 films were made based on his novels. In 2001, Garcia Marquez founded the Iberoamerican Foundation for New Journalism. This foundation will select the best Latin American, Spanish, and Portuguese journalism every two years. The prizes go, to the best work for broadcast, radio and the Internet. Garcia Marquez’s socialist and anti-imperialist ideas were labelled as subversive and thus he was denied visas by the US government. This visa ban was lifted during the presidency of Bill Clinton. In 1999 he was diagnosed with lymphatic cancer, but chemotherapy was successful in Los Angeles and illness went into remission. Garcia Marquez resided the last three decades of his life in Mexico City, during which he was still creative. Garcia Marquez who was affectionately called Gabo, throughout Latin America, died on April 17th in Mexico City due to the recurrence of his lymphatic cancer. He was cremated on April 22nd and his ashes were laid at the Palace of Fine Arts in Mexico City.